Kettle Uber is a generic physically plausible 'uber' shader. It is designed to form a 'base shader' for all shaders used in a scene to give you a consistent set of scene wide AOVs, yet is not prohibitive - you can still use whatever shaders you like by using it as the end node in your shading graph. Kettle has various BRDFs (including refraction and anistropy), coloured transmissive shadows, multiple fresnel modes and a powerful and flexible AOV setup. It also implements MIS for all reflective BRDFs. The illumination tab is divided into 5 sections: diffuse, including backfacing and optimisations, as well as SSS and emission. Scale The intensity of the diffuse color. Color The diffuse color value. This models translucency on thin surfaces, simulating light falling on the back of the object passing through to the front. Think leaves on a tree. This should only be used on single sided surfaces; objects with thickness will render incorrectly. Scale The intensity of the backfacing effect. Limit diffuse rays Limits the maximum depth of diffuse rays for this shader, overriding the figure set in the pass’s Arnold Render Options. This will only limit the number of bounces calculated, never increase the maximum above the figure set in the Arnold Render Options. 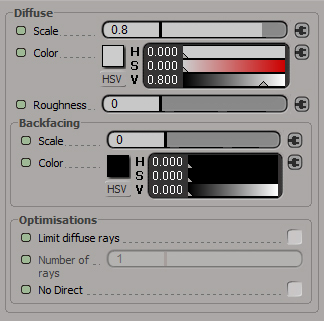 Number of rays Maximum diffuse depth. No Direct Don’t add direct lighting to the result. Experimental feature. Kettle Uber’s SSS provides a up to three blended layers of SSS that can be activated as required. Scale The overall intensity of the SSS effect. Radius multiplier The backfacing color. Normalize Normalizes the SSS layer weights to add up to a combined weight of 1. For example, if all three layer are active with a layer weight of 1, the layer weights will be balanced to 0.333 before being added to the final result. You most likely want this on, but get the option of turning it off for more artistic control. SSS method Determines the model used to calculate SSS - pointcloud gaussian or raytraced single scatter. Raytraced single scatter is most suited to thin, low radius effects, such as an epidermis layer, where pointcloud gaussian would require a very high point count for an accurate result. Pointcloud gaussian, identical to the standard shader’s model, is in turn more suited to deeper SSS effects such as wax. The two models can be used in combination - for example using raytraced single scatter for the epidermis of a skin shader, and pointcloud gaussian for the deeper underlying layers. Weight The weight of this SSS layer. Forward/Backward scattering Henyey-Greenstein phase function coefficient, in the (-1,+1) open interval, where 0 means isotropic scattering, positive values mean forward scattering, and negative values mean backward scattering. Uh-huh. Ask Marcos :). Color The color value of this SSS layer. Radius The radius of this SSS layer. Internally multiplied by the radius multiplier. Depending on whether Use RGB radius is on or not, this can be a scalar or RGB value. 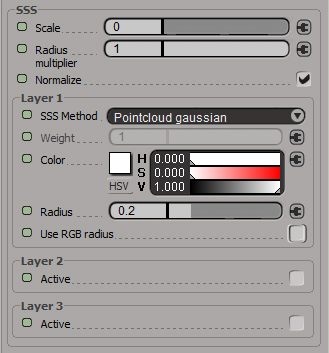 Use RGB radius Activate the option of using RGB values for the radius. Simulates the material emitting incandescent light. Scale The intensity of the emission effect. Color The emission color value. BRDF The reflectance BRDF. Option between Microfacet (normal) or Anisotropic (stretched) reflection. Scale The relative amount of reflection. Color The color of the reflection. Roughness The sharpness of the reflection, where 0 equals mirror reflection, and 1 equals frosted. Stretch (Anisotropic only) The intensity of the anisotropic reflection effect. 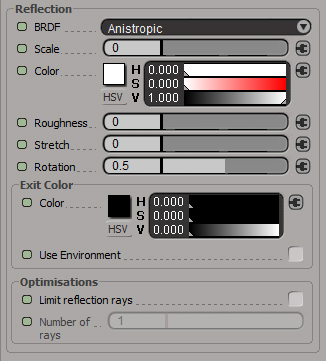 Higher values will produce a more pronounced anisotropic reflectance effect. Rotation (Anisotropic only) The direction of the anisotropic effect, where the values 0 to 1 map to 0 to 360 degrees rotation. Tip: Remember to apply an Arnold Parameters property to any objects with anisotropic reflection, and check on Smooth subdiv tangents. Check the Arnold Properties docs for more information. Color The color returned when reflection rays hit the maximum depth. Use Environment Return the environment color instead of the above solid color when reflection rays hit the maximum depth. Limit reflection rays Limits the maximum depth of reflection rays for this shader, overriding the figure set in the pass’s Arnold Render Options. This will only limit the number of bounces calculated, never increase the maximum above the figure set in the Arnold Render Options. Number of rays Maximum reflection depth. Fresnel Mode The fresnel model. Option between Fresnel, IOR, Curve or Metal. Determines the reflectivity via a fresnel coefficient. Use RGB fresnel Option to set a seperate the fresnel amount for each color channel. Fresnel amount The fresnel coefficient. When Use RGB fresnel is active, a fresnel coefficient can be given for each color component. 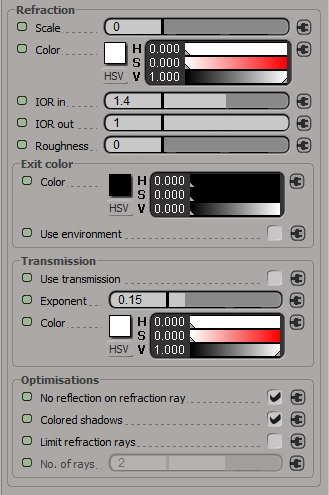 Uses the material’s index of refraction, set in the Refraction/Transparency tab, to determine the reflectivity falloff. Has no further parameters. Replicates the Mental Ray Architectural shader’s curve mode. Facing The reflectivity value for surfaces that directly face the viewer. Perpendicular The reflectivity value for surfaces that are perpendicular to the viewer. Exponent The falloff exponent defining the reflectivity of intermediate angles. 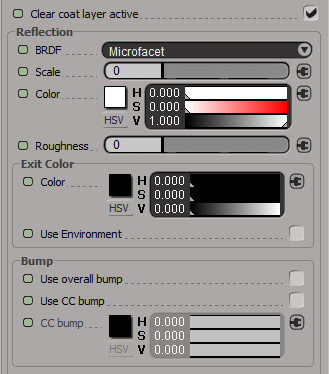 The metal mode accurately models the reflection on metals, and offers a wide array of metal presets pre-populated with values drawn from refractiveindex.info. 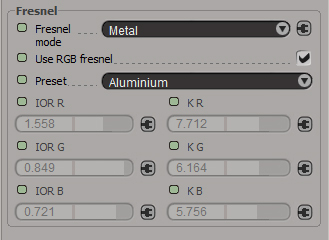 Use RGB fresnel Option to set a seperate the fresnel amount for each color channel individually. Offers higher accuracy at the expense of speed (three calls to the fresnel function versus just one). When disabled, only the R value is used. Preset A selection of presets with values for different metals. The custom option allows values to be entered manually. IOR The index of refraction. The clearcoat reflection layer offers the same options as the reflection tab, bar three additional options detailing the layer’s bump behavior. Clearcoat active Determines whether the clearcoat reflection layer is used. Use overall bump Determines whether the clearcoat reflection layer is affected by the overall bump, piped into the shader on the Options tab. Use CC bump Determines whether the clearcoat reflection layer is affected by a independent bump, which affects only this clearcoat layer. CC bump An independent bump effect affecting only this clearcoat layer. Color Add the output to the beauty render (additive). IOR in Disable to allow this AOV to ignore the shader’s bump input. IOR out Output color. Plug in further shader trees here. Roughness The clarity of the refraction, where 0 equals perfect clarity, and 1 equals a frosted effect. Color The color returned when refraction rays hit the maximum depth. Use Environment Return the environment color instead of the above solid color when refraction rays hit the maximum depth. Colours the object based on the distance travelled according to Beer’s Law. Useful for simulating mediums that have a volume colour, for instance coloured glass or jelly etc. Use transmission Turns transmission on/off. Exponent Intensity of the transmission. Color Color of the transmission effect. No reflection on refraction ray Prevents reflection rays spawning on refraction rays, potentially significantly reducing render times at the cost of some accuracy. Colored shadows Turns colored shadows on/off. Gives a small performance boost. Limit refraction rays Limits the maximum depth of refraction rays for this shader, overriding the figure set in the pass’s Arnold Render Options. This will only limit the number of refraction calculated, never increase the maximum above the figure set in the Arnold Render Options. Number of rays Maximum refraction depth. Opacity Determines the opacity and colour. White is opaque, black is fully transparent. Additional options and utilities not directly related to the shading modes. Write AOVs When true, Kettle Uber will write to AOVs. Useful if you have chained Kettle shaders that all write to AOVs - make sure write AOVs is off except the last Kettle in the chain. Z minimum Closest point to camera. Z maximum Furthest point from camera. Holdout camera rays Render RGBA = 0 for the camera rays, effectively punching a hole where the object would be, but still allowing its reflections / GI etc to be visible in the surrounding objects. 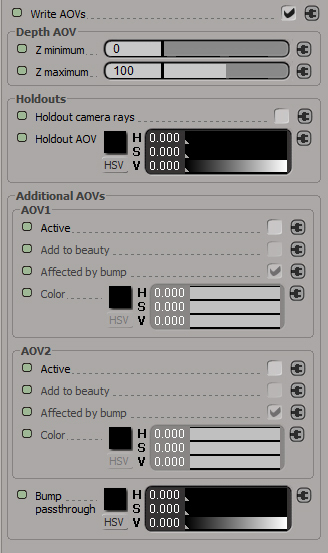 Holdout AOV An arbitrary RGB AOV for the purpose of generating a 3 channel holdout. True to their name, these channels allow two additional arbitrary outputs to be written for this shader. Add to beauty Add the output to the beauty render (additive). Affected by bump Disable to allow this AOV to ignore the shader’s bump input. Color Output color. Plug in further shader trees here. Bump passthrough Plug in a bump node here. Please note only perturbation of the normal is used, therefore any color or surface shading will be calculated but ignored - it’s recommended to use the kettle bump node.